The General Secretary of Nigeria Football Federation, Dr. Mohammed Sanusi has categorically denied telling any media organization that he was aware of defender Abdullahi Shehu’s ineligibility for the Algeria/Nigeria 2018 FIFA World Cup qualifier in Constantine last month. “I am shocked to be so copiously quoted in a national newspaper of Friday, 15th December 2017. The reporter even said I was aware of the player’s ineligibility among so many other things. I am disgusted because I did not say what the reporter attributed to me. The NFF chief operating officer insisted that he was too experienced an administrator to make statements on an issue for which an inquiry had been instituted. NFF President Amaju Pinnick on Wednesday set up a four-man committee headed by Barr. Seyi Akinwunmi (NFF 1st Vice President) to thoroughly investigate the matter and submit a report, alongside their recommendations, within two weeks. “I earnestly appeal to all Football Stakeholders, including the media, to allow the committee to do its work without making insinuations or dwelling negatively on the subject,” Sanusi added. Bafana Bafana coach Stuart Baxter says it’s vital that they try and keep it tight and silence the crowd in Uyo on Saturday. The South African national team will lock horns with the Super Eagles of Nigeria in a 2019 Africa Cup of Nations (Afcon) qualifer later today. “I think we’ve got to shut the crowd up. That’s one of our big jobs. If we let the crowd get excited and Nigeria enjoy the game, then I think that’s going to be a big plus for them,” Baxter declared. Bafana’s main intention is to frustrate their hosts, bearing in mind that history will be against them in Nigeria. “I think we can turn that around (the string of losses to Nigeria) and frustrate them a bit, and be better than they think and have more to say than they think, then maybe the crowd could be a bit negative for them,” Baxter said. “With the mental part of the game, the boys have to feel that this is one where we can spoil the party a bit. We can make it difficult for Nigeria,” Baxter added. Meanwhile, Baxter’s counterpart Gernot Rohr believes Bafana are the strongest opponents he will get to face since taking over as head coach of the Super Eagles. “They are the strongest opponent I will face so far as (Super) Eagles coach because they have not lost a match over a long time. I’m also aware that they stopped Nigeria from getting to the AFCON in 2015, and that this match is very important for Nigeria. The game will be difficult, it will be a big challenge to beat the South Africans,” Rohr said. Super Eagles supporters especially the teeming indigenes of Akwa Ibom State have been availed the opportunity of watching the high class Nations Cup qualifier between the Super Eagles of Nigeria and Bafana Bafana of South Africa for only One thousand Naira (N1,000). The Akwa Ibom State Commissioner of Youth and Sports, Sir Monday Ebong Uko confirmed this in Uyo on Wednesday. He emphasized that hosting a top notch match like this cost millions and one is expected to recuperate some expenses from the gate yet the Sports loving Governor Udom Emmanuel led government will rather crash the gates to allow fans to fill the stadium and cheer the Eagles to victory at virtually no cost. The commissioner said. The reserved side will go for Two thousand Naira only. Mr Paul Bassey, the Senior Special Assistant to the governor on Sports confirmed the Governor magnanimity and urged Akwa Ibomites to take advantage of the governors good will and turn out in large numbers to cheer the Super Eagles to victory. The tickets are already on sale since Thursday at designated points, including top hotels like Le Meridien and Monty Suites on Four Lane, The Akwa United Club House, the Ibom International airport among others. President of the Nigeria Football Federation, Mr. Amaju Melvin Pinnick has charged organizers of the Nigeria Pitch Awards to ensure a seamless fourth edition of the Awards, which ceremony comes up in Uyo on Saturday. Speaking in Abuja on Tuesday, the CAF Executive Committee member and President of the Organizing Committee for the Africa Cup of Nations insisted the NFF has continued to back the Pitch Awards because the leadership is enamoured by its transparency, credibility and integrity in the four years of the event. “The Nigeria Football Federation is satisfied with the processes that the organizers bring into play for selection of voters, nomination, collation and eventual declaration of the winners. We urge the organizers to retain those processes for the good of the Awards. Organizers of the Awards, Matchmakers Consult International Limited, confirmed to thenff.com on Tuesday that Akwa Ibom State Governor Udom Emmanuel, who is nominated for Football Friendly Governor of the Year alongside Akinwunmi Ambode of Lagos and Ezenwo Nyesom Wike of Rivers, will attend Saturday night’s programme, scheduled to begin at 8pm at the Nwaniba Hall of the Le Meridien Hotel and Golf Resort. The nominees for the 4th Nigeria Pitch Awards were made known last month, after SIAO Partners Limited, the collating and verification firm, released the results to the Nigeria Football Federation. In a letter to the NFF President, signed by SIAO’s Managing Partner, Pastor Ituah Ighodalo, the auditing firm explained that the voting was done by Nigeria sports editors/managers across the 36 States of the Federation and the FCT. The Executive Committee of Nigeria Football Federation on Tuesday clarified the situation with regards to the recommendation of its Technical and Development Committee that Frenchman Paul Le Guen be named the new Technical Adviser of the Super Eagles, saying all sub –committees in the Federation can only make recommendations to the Board. Chairman of the NFF Media and Publicity Committee, Hon. Suleiman Yahaya-Kwande, dismissed reports in local and international media of the Frenchman’s rejection of the position as simply preposterous. Nigeria’s U20 squad, the Flying Eagles, will depart the Nnamdi Azikiwe Airport, Abuja aboard an Ethiopian Airways flight on Wednesday, 6th July on their way to Khartoum for a 2017 Africa U20 Cup of Nations qualifying match against their Sudanese counterparts. Coach Emmanuel Amuneke, while addressing the boys Saturday morning after their 8-0 thrashing of Oyah Sports FC of Suleja in a friendly, described the match in Sudan as ‘the mother of all battles’ and warned that the team must maintain high level of discipline and focus to surmount this final hurdle. “Let me first congratulate you for the performance today. I am impressed with your approach to the game from start to finish. I hope we all realise the enormity of the task ahead, as we must remain focused and disciplined to achieve our aim of picking one of the seven tickets to the continental soccer showpiece,” he said. In the absence of forward Victor Osimhen who has just returned to training after injury, Orji Okonkwo has continued to fill the void, banging in two against the U23 Eagles and three on Saturday against the Suleja -based Nationwide League side. 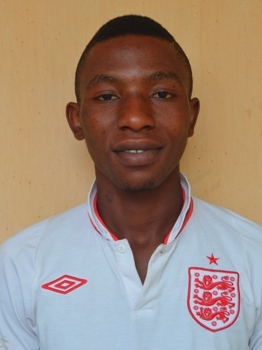 ABS FC of Ilorin forward Kehinde Ayinde has also discovered his scoring form. The petit striker scored two as the Flying Eagles thrashed Amakson Academy 4-1 on Wednesday morning and added another two on Saturday to take his tally to four in two matches. Left back Umar Johnson scored his first goal for the Flying Eagles and celebrated with team-mates, while second half substitutes Samuel Chukwueze and Kelechi Nwakali completed the rout to make it 8-0 in favour of the Flying Eagles. The Emmanuel Amuneke –tutored side has played over twenty friendly matches since starting its camping in Abuja on 9th April, drawing only two and losing none. The team will tackle a Sudanese side that is yet to kick a ball in the qualifiers following the withdrawal of second round opponent, Malawi. The match earlier fixed for Friday, 8thJuly, has now been moved to Sunday, 10th July by the Sudanese Football Federation. The Flying Eagles will take on City Strikers of Abuja on Tuesday evening at the mainbowl of the National Stadium, Abuja in their last friendly game before departing for Sudan. .With the anxiety over who become the Manager of the Nigeria national team, Super Eagles, after the release of the grouping for the World Cup qualifiers, the Nigeria Football Federation (NFF) seems to have swung into action to ensure that the country quality for the tourney. According to report emanating from the Glasshouse, the N F F will on Friday, 8th July release a short-list of candidates for the vacant position of Super Eagles’ Head Coach. However, the Federation’s Technical and Development Committee has set a deadline of Wednesday, 6th July 2016 for interested candidates to apply for the position. Chairman of the committee, Barrister Chris Green, told the nff.com that applications are invited from all persons who feel they are qualified for the position, as the three –time African champions get set to begin preparations for an interesting 2018 FIFA World Cup qualifying race against Algeria, Cameroon and Zambia. “We encourage applications from all highly –qualified persons, whether they be Nigerians or expatriates. Applications are welcome until Wednesday, and the Technical and Development Committee will meet on Friday to look through all applications and release a short-list,” Green stated. The Super Eagles are away to Zambia’s Chipolopolo on Matchday 1 (October 3) and will then host the Fennecs of Algeria on November 7. They will then host Cameroon’s Indomitable Lions on August 28, 2017 and visit the Lions five days later, before hosting Zambia a month after and then rounding off the series by visiting Algeria on November 7, 2017. Algeria beat Nigeria home and away in the qualifying series for the 1982 World Cup in Spain, but Nigeria returned the compliment in the qualifying series for the 2006 World Cup in Germany. Nigeria threw Cameroon out of the race for the 1970 World Cup finals, but then lost to the Lions in the race to the 1990 World Cup finals. Cameroon also beat Nigeria in three Africa Cup of Nations final matches (1984, 1988, 2000), but the Super Eagles eliminated then holders Cameroon in the Cup of Nations quarter finals in 2004, beat the Lions to the LG Cup title and whiplashed the neighbours 3-0 in a friendly in Belgium in October last year. Zambia pipped Nigeria over two legs in the last hurdle to the 1986 Africa Cup of Nations finals, but the Super Eagles stopped the Zambians at the semi final stage of the 1990 finals in Algeria, edged the Chipolopolo in the final of the 1994 championship in Tunisia, and also pipped the southern Africans in the quarter –finals of the 1992 and 2010 championships. Welcome to the start of the Summer transfer window for 2016. Even before the shutter of the window clicks there had been some behind the curtain activities that the curtain could no longer hide. Footyonside is ready to go all the way in reporting the linked movements, done deals and missed opportunities of the window. England as usual will be a beehive of activities these transfer season, with new managers at the helm of affairs at clubs like Chelsea’s Carlo Ancelloti, Manchester City’s (Pep Guardiola) and Manchester United’s (Jose Mourinho). Liverpool”s Jurgen Klopp also want to establish himself in the Premier League. However while Arsenal’s Arsene Wenger started the behind the curtain activities by snapping up Granit Xhaka from the German Bundesliga, he seems to have gone into hibernation not minding the fact that he triggered the buyout clause of Leicester City’s Jarmie Vardy. Ever since then, the French tactician seems to have forgotten that his primary assignment is to ensure that the Gunners build on their ” accidental ‘second position from the just concluded season. Rather Le Prof is very busy with his pundit work at Euro 2016 in his native country France while other managers are busy solidifying their teams. The most annoying part is that one after the other, players that are linked with the team are been snatched up by direct rivals in the English Premier League. Among such players are Zlatan Ibrahimovic and Henrikh Mkhitaryan both to wear the Manchester United colour for the 2016 /2017 season. While it is a good thing that Wenger’s knowledge of the game is been recognized, the fact is that it is negatively affecting the transfer activities of the team. The last summer transfer window is still fresh in the mind of many Arsenal fans. Gonzalo Higuain, Kareem, Benzeama and a host of other missed opportunities while Wenger was in South America covering the Copa America tourney in Chile. Now this summer transfer window is about to take the same shape. Reports are out via The Mirror on Sunday that Manchester United manager, Louis van Gaal has hired security to protect him and his wife. This according to report is as a result of the fear of been attacked by angry Manchester Unite fans who could turn up at his doorstep to express their angers. It’s unclear from the tabloid’s report whether there has been any real threat of violence towards LVG or his wife, or whether these measures are purely proactive. Either way, the story seems to be yet another attempt to show how fragile Van Gaal’s position is at Old Trafford. Even after the Red Devils produced a fine 3-1 away win at Derby in the FA Cup. In other Man United news in the Sunday papers, the Express have a fearful report that the Glazers are making cuts to the club’s academy. This story is underpinned by the woeful record of the club’s U18s, who have lost their last 12 games in a row.